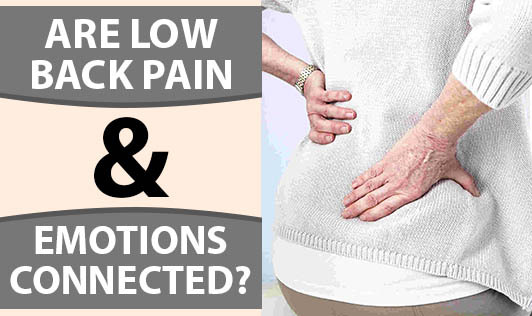 Are Low Back Pain & Emotions Connected? Ancient & alternate medicine believes that the sacral chakra (one out of the seven chakras) controls the health of some areas of the abdominal region including the lower back. It is believed that any imbalance in this chakra can lead to low back pain. It is also supposed to be connected to emotions. Unresolved emotional issues can contribute to back pain. Modern science has now found its own explanation to this connection. Scientists say that low back pain can affect your mood, particularly if it’s chronic. It can affect your sleep, eating habits, concentration and perhaps your work abilities too. The stress of not being able to function normally further tenses up the back muscles, which in turn makes the pain worse. Also avoiding physical activity due to low back pain can make a person weak. It can become a vicious cycle if ignored. Do not ignore a back pain however mild it may be. Consult your doctor immediately. If you're keen, you can check with your doctor if any alternate therapy will help your situation.